Big lumps of slippery smooth tofu the texture of crème caramel rose and fell in the chilli hot currents of the deep red liquid slowly swirling in front of me, the odd prawn floating to the surface. I wasn’t sure what I was expecting jjigae to to be, but it wasn’t this. Not that I was disappointed, far from it, this was exciting. I’ve eaten a lot of food from a lot of countries over the last three decades but Korean is a new thing to me. And boy, have I been missing out. Tohbang was my first brush with the spicy pungent delights of Korean food. And has now delivered a quick one-two punch of further fun. So really, I’ve not so much been eating Korean cuisine so much as Tohbanging a particular take on it. If the rest is anything like this, I’m sold. This time, we delved into the new express lunch menu. Express it may be, but all the classics (i.e. Korean dishes that I’ve actually heard of) seem to be there: bulgogi, bibimbap and jjigae all appear in various permutations of tofu, vegetable, meat and seafood. Sundubu Jjigae was a vivid blood red soup with a chilli oil slick floating menacingly on top while great white lumps of soft tofu floated just below the surface like an albino kraken waiting for an unsuspecting ship. In amongst the deliciously soft and slurpy tofu, petite prawns and the odd clam floated, and buried at the bottom like a pirates treasure, a lone egg yolk. The mix of hot oil, tasty stock, slippery tofu and yolk made for an unusual, but terribly moorish texture and surprisingly soft taste (albeit with a chilli kick). This was warming, restorative stuff. If you like your eggs soft boiled, then you will definitely like this. Bulgogi was much less spectacular to look at, but the boring brown strips of stir fried beef disguised a sweet, meaty and tender mouthful. Marinated in pear juice and soy, this was a bit of a revelation for me. Not over spiced, but gentle and friendly, it was a most unusual combo. One I will be trying to replicate soon. 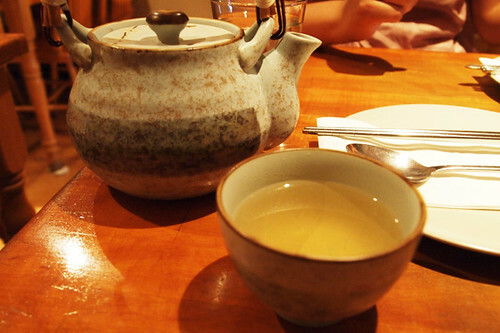 Coming in at £10 a head including unending cups of Korean tea, this is a bit of a bargain. If you go for the main rather than lunch menu you would probably add another fiver but not much more. Haha – wonderfully apt description! I love jjigae with a passion and loads of us are fans of the soft tofu version. 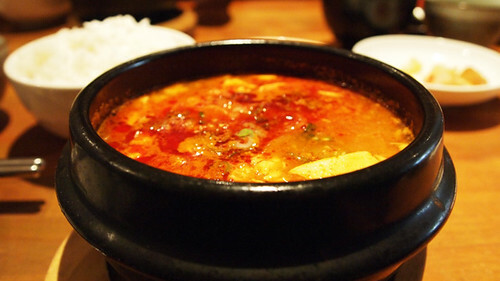 You should try Koba too – their take on sundubu jjigae is even more exciting though Tohbang’s is definitely admirable. Where’s the pajeon or however you spell it? IMHO, no Korean meal is complete without this mighty fine pancake (has to be seafood version). PS: Did this place used to be New Seoul? @Meemalee – thanks! I really really enjoyed the jjigae, it was totally unexpected – particularly as i didn’t read about the egg at all. I will try Koda as soon as I can, heard many great things about it. @Mr Noodles – it might well have been there, i had eyes only for the jjigae and the bulgogi, will keep an eye out for pajeon though. And yes, this place did used to be New Seoul. That’s final, I’m dragging you out to Kimchee. It’s a Golders Green institution. We’re going to get pajun (seafood pancake) you’ll love it! Ooooh, I adore soondubu jjigae… and budae jjigae… and kimchi jjigae. I like all jjigaes. Was thinking about Korean food yesterday and talking about how we haven’t had any in ages. I might have to look this place up! @Mary-Rose – we WILL get out there, an evening trip beckons in the Autumn methinks.